Is China Delivering on Economic Reform Promises? Chinese regime leader Xi Jinping wants reform. He wants to reduce overcapacity, corruption, and the reliance on the state to manage the economy. So far he has made good progress in the anti-corruption campaign but achieved virtually nothing regarding overcapacity. And monetary stimulus is still used to paper over short-term volatility. Closing down inefficient steel, coal, and aluminum producers is important for commodity prices to recover so that economic producers can make money and survive. “We remain highly skeptical that there is any real underlying change to the way heavy industries are operating and believe that the margin recovery in steel, in particular, is largely due to better demand from stimulus, rather than supply-side reforms,” investment bank Macquarie wrote in a note. The goal of the reform is to close down excess capacity in steel and coal, for example, and make Chinese producers more efficient. It is hard for local provinces and government to overcome the pain imposed from layoffs and debt write-offs. And while a significant amount of capacity has been closed so far in 2016, it is far below target. According to the National Development and Reform Commission (NDRC), producers reached only 38 percent of their coal capacity and 47 percent of their steel capacity target cuts. 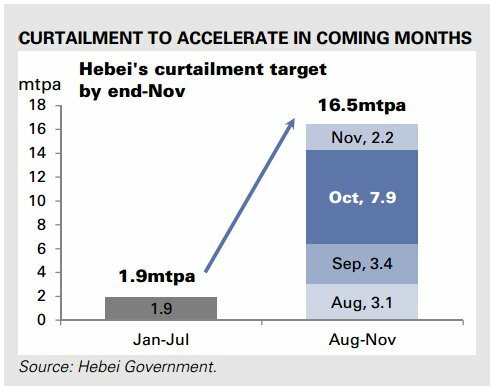 For example, Hebei Province was supposed to close down 18.4 million tons of steel-producing capacity in 2016. By the end of July, it had only closed down 1.9 million tons, according to Goldman Sachs. Macquarie believes it’s the local governments and State Owned Enterprises (SOEs) that aren’t committed to accepting short-term pain for the sake of long-term gain. And who can blame them, as they are the first to feel the heat of workers’ dissent. During a recent strike at a coal mine in the northern province of Shanxi, police and strikers clashed. Several workers were beaten up or detained. The Hong Kong-based China Labour Bulletin reports a total of 1,454 strikes and protests in the first six months of 2016, an increase of 18.6 percent compared to 2015. According to Macquarie, as many as 2 million workers out of 11 million in the mining and smelting industries could lose their jobs if the reform targets are met. So local governments are trying to postpone real economic pain for as long as possible by making the debt of bankrupt companies evergreen and by spending on infrastructure investment themselves. In the first quarter of this year, Local Government Finance Vehicles (LGFV) issued $115 billion worth of bonds, the highest quarterly figure on record. According to Goldman Sachs, 11 out of 18 high-profile defaults have not been resolved since the first official default of a Chinese company by Chaori Solar in 2014. 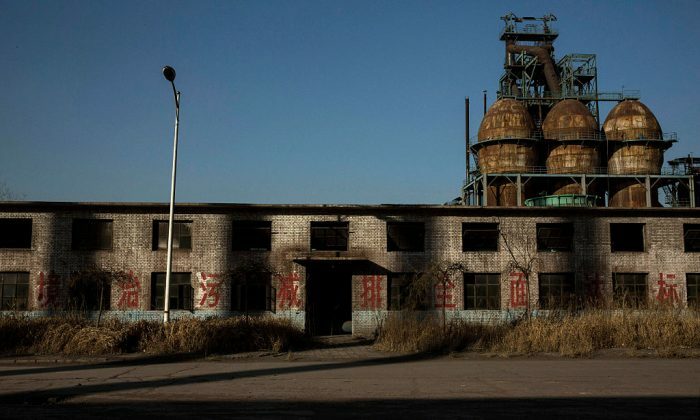 The best example of a local government trying everything to avoid a painful debt restructuring is Dongbei Steel, which defaulted on $6 billion of debt but is still in business. Bondholders pressured Liaoning Province to finally resolve the situation and demanded that the local government stop raising money to support Dongbei. Our industry contacts continually tell us that they do not believe capacity closures under supply-side reforms will have any impact on output or prices. The central planners aren’t happy with the progress and have issued a stern directive to use stricter environmental standards to close more of the inefficient businesses. The Ministry of Industry and Information stated in a draft document on its website that it would “normalize the stricter implementation and enforcement of mandatory standards” and apply harsh measures if the standards aren’t met, according to Reuters. It threatens to cut off loans, power, and water supply and destroy company equipment. There is another problem. Even if the central planners achieve their capacity reduction goals, production won’t go down. “Our industry contacts continually tell us that they do not believe capacity closures under supply-side reforms will have any impact on output or prices. There is a clear belief among our contacts that there remains enough latent capacity in the system that no “effective operating capacity” will need to be closed to reach the target outlined by the government,” wrote Macquarie. Let’s take steel as an example. China can produce 1,250 million metric tons per year, but production is only 804 million metric tons. So even if China managed to close 450 million metric tons of capacity, it could still produce the same amount of steel. However, the plan until 2020 looks for a reduction of only 172 million metric tons until 2020. The situation in the coal and nickel markets is similar. As a result of the overcapacity and a slowing economy, the Shanghai Steel Rebar Future price collapsed from $780 in April of 2011 to $244 in late 2015 before rebounding a bit in early 2016, mostly because of government stimulus and not because of capacity reduction, says Macquarie. Because Chinese steel makers are high-cost producers—especially the SOEs—many of them are teetering on the verge of bankruptcy, as they cannot cover interest rate payments at current prices. So we are back to square one. Low-efficiency capacity needs to be reduced significantly to ensure a rebound in prices and a better future for economic producers. This process inevitably leads to worker unrest and has a negative effect on the banking system, where bad loans are skyrocketing. If China doesn’t close down inefficient production capacity, prices stay too low for efficient producers to make money and eventually they will run into trouble as well. No short-term pain, no long-term gain.